Jack Hammer is a hard-nosed detective that is going after the dangerous madman Evil Dr Wüten. Will Jack Hammer succeed in stopping this nasty Dr Wüten and save the planet? 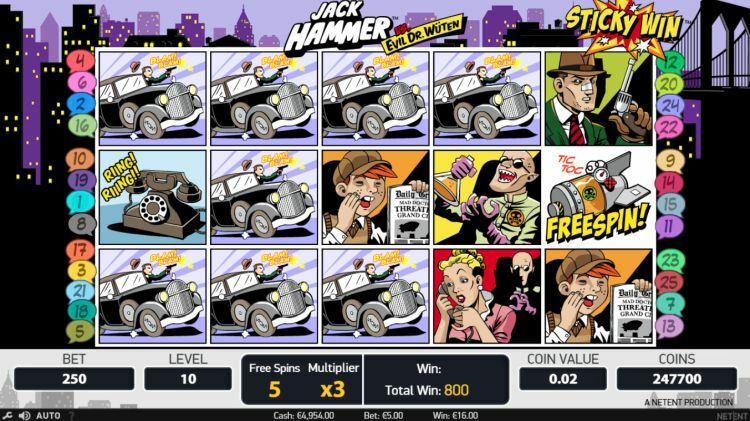 This online slot by Netent is a real casino classic, and there are not too many people that have never played Jack Hammer. After all, this is an insanely fun slot, with a real storyline, beautiful cartoon-like graphics and a unique game mechanism. Jack Hammer was released in 2010 by Netent and has since proven to be one of its biggest successes. This slot by Netent has a very nice payout rate of 97%. The variance is on the low side. You often win a small prize, sometimes a medium one and very seldom will you get yourself a big prize. This slot may well prove to be the perfect slot to free up a welcome bonus because chances are that you will fulfil the playing conditions before you spend your starting balance. How does the Jack Hammer slot work? The game consists of 5 reels with three symbols per row. The number of paylines is 25, and the betting range lies between $€ 0.25 and $€ 250 per spin. The symbols that are part of the game all have to do with the battle between our very own Jack Hammer and that diabolical Dr Wüten. There are 10 different symbols, with the highest value attributed to the symbol of Jack Hammer: 1,000 coins are yours if you manage to get 5 of these on an active payline. Dr Wüten is worth 300 coins and Jack’s blond sweetheart comes in at 250 coins. The old fashioned bomb with the time mechanism is the scatter and that will deliver the free spin bonus. Sticky Win Feature – spin as long as you win! 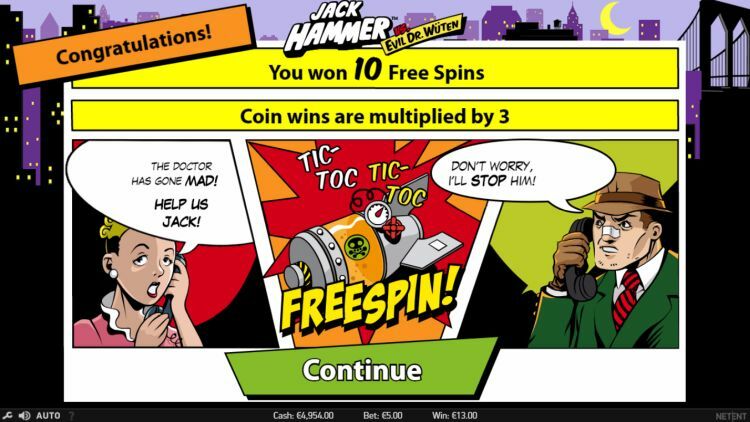 Jack Hammer has a unique game mechanism: once a winning combination is made, the reels will stop, and you get a free respin. If you manage to make more winning combinations during the free spin, the process will repeat itself. This will keep on going until there are no more new combo’s to be made. So, it is possible to end up with a screen full of winning symbols, while you started with only one combination of 3 symbols. This Sticky Win Feature always cranks up the excitement: you just never know how a turn is going to end. If you spin 5 or more scattered bomb symbols, you win the free spin bonus. The higher the number of scatters on the screen, the more free spins you win. The minimum number is 10; the maximum is 30. It is possible during the bonus to win even more free spins. And just a heads up, during this time all winnings are multiplied 3 x. Not bad. Our verdict on the Jack Hammer video slot? This slot by Netent has grown to become a true online casino classic, and for a good reason. 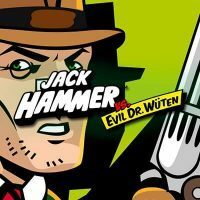 We feel the variance is a bit too low for our liking, but we have indeed spent many an hour enjoying Jack Hammer and his fight against the horrible Dr Wüten. The theme is brilliantly worked out, and the Sticky Win Feature assures regular excitement. We award it a solid score! Where can you find Jack Hammer? The Jack Hammer slot is found at all reliable Netent casinos. One of these Netent casinos is Casumo, which is one of our favourite online casinos. 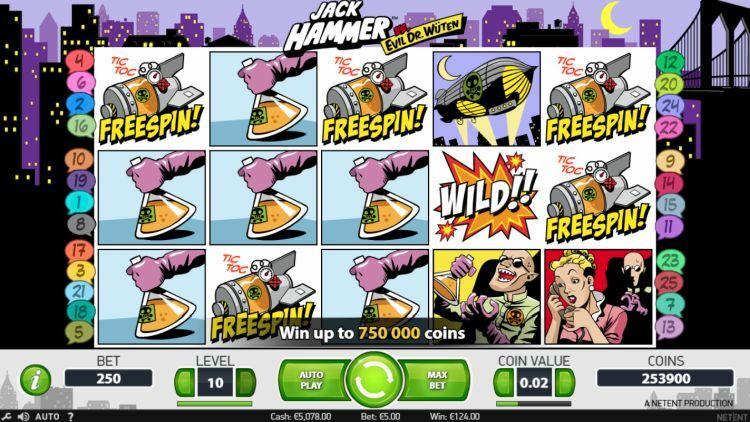 You can play the Jack Hammer slot at Casumo with a 200% bonus up to $€50 plus 200 free spins.